Condominiums are no longer just residential properties. 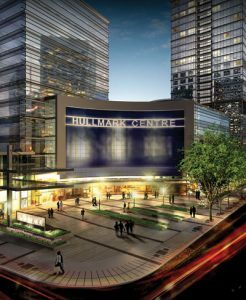 Hullmark Corporate Centre, a development on the south east corner of Yonge St. and Sheppard Ave., is a mixed use development of over 1 million square feet. It includes two towers on either side of a central plaza and retail space. There will be direct access to two subway lines plus regional transit from Hullmark Corporate Centre. Access to Highway 401 is minutes from the Yonge and Sheppard intersection. Unique to Toronto, this complex is a combination of residential and commercial condominiums. Commercial condominiums comprise 198 units on the lower twelve floors of the north tower with occupancy beginning in the fall. Each purchaser can choose from standard designs for medical spaces or other uses. Suites range from 900 to 1,500 square feet and can be combined to create larger spaces. There will be a two-storey lobby for business use only. The remainder of the two towers are residential condominiums. The central plaza between the two towers will include retail and restaurant space. Announced tenants include Whole Foods supermarket, Royal Bank, Rexall Drugs and Chipotle restaurant. Commercial condominiums offer advantages over a traditional lease arrangement. For the owner of a commercial condo rising rents are no longer a concern. There is no risk of a landlord initiated lease termination or the challenges of dealing with a difficult landlord. The property can be sold at any time without lease termination costs. The cost of security and cleaning, usually the responsibility of each tenant, becomes a shared cost managed by the Property Manager. Commercial condos are considered by some to be a better solution for professionals such as accountants, lawyers, doctors and dentists.